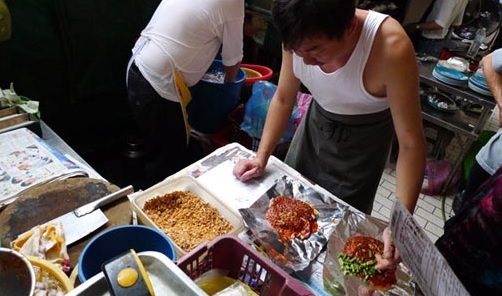 Petaling Street or Chinatown is practically jam-packed with a chain of hawker stalls and Chinese restaurants that sell a variety of delicacies; no high class restaurant but always the localise and delicious food while experiencing the local feel. Portuguese Grilled Fish is definitely a must try when visit to Chinatown. 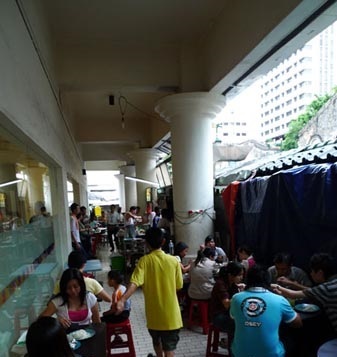 This stall is located at the alleyway fronting the Hong Leong Bank. They serve Portuguese Style Grilled for various seafood (Stingray, Lala, Squid, Prawn, others kind of fish and also vegetables) with its special invented sauce. Level of spicyness can be adjusted, ingredients are chucked into aluminum foil, and then cooked over charcoal fire. Honestly the dining environment is not that good, but who cares for a good food. It can takes up to 1 hour waiting time during crowd period, the boss will tell you the exact time your dish will be ready, so order your choice of seafood and then go off to some shopping in Chinatown. Just remember to come back at the stipulated time. We ordered a combination of Stingray, lala and squid in large size (less spicy) which enough to share between 3 persons; it cost RM25. The dish came with some vegetables as well. Hints the spicyness is a kill for those who can't affort, who those can't eat spicy, may opts for less spicy. The seafood freshness is ok, the sauce is good with a bowl of white rice. Personal opinion that it not taste as good as my first try during my uni time, the sauce is come with slight taste of charcoal. However, if you never try this before, it still a must try with reasonable price in Petaling Street. The stall clearly stated that no outside drinks or foods is allowed, suggestion to grab a cup of Luo Han Guo Longan drink /Air Mata Kucing/罗汉果龙眼水 to release your spicyness. Enjoy!